Photo by Justin A. Irving; new Vikings Stadium in process. 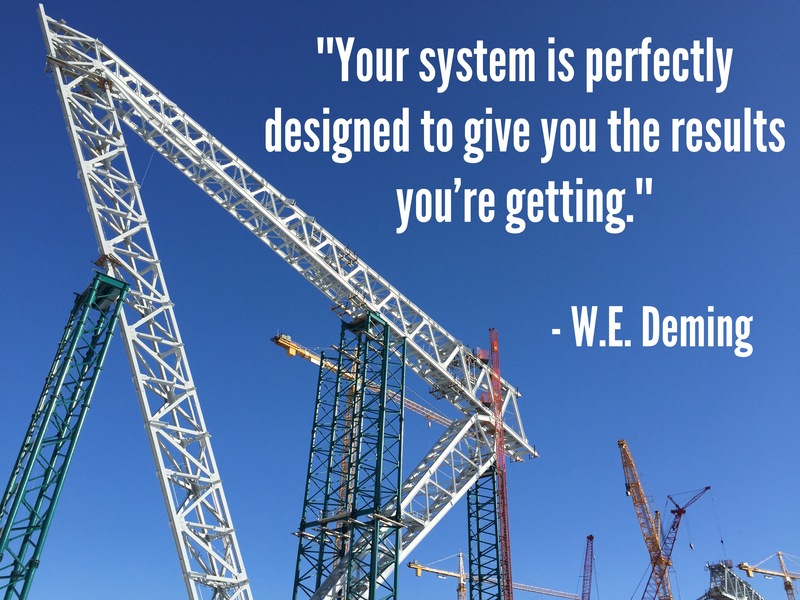 One of my favorite quotes from W. Edwards Deming is “Your system is perfectly designed to give you the results you’re getting.” What a great reminder. And, this helpful reminder raises a key question: What are your results telling you? Deming is a key figure in operations management and the pursuit of continuous improvement within operational systems. Management theories like Total Quality Management (TQM) and beyond have been significantly shaped by Deming’s key principles. While Deming’s work is primarily designed for macro operational settings, the lessons are helpful for both organizations and individuals. What are your results telling you organizationally? What are your results telling you individually? Deming is known for 14 Key Principles in his approach to management. I will not review all of these here since they get into specific dimensions of organizational operations. However, here are a few high points of these principles from Deming’s book Out of the Crisis. Prioritizing the Creation of Constancy of Purpose: “Create constancy of purpose toward improvement of product and service, with the aim to become competitive and to stay in business, and to provide jobs.” Improvement at the organizational and individual level does not come by constantly changing focus. Deming’s first point reminds us of the importance of staying the course, remaining focused, and keeping our aims before us. Are you constantly changing your aims, or are you maintaining constancy of purpose and staying focused on what matters most? Committing to Improve Constantly: “Improve constantly and forever the system of production and service, to improve quality and productivity, and thus constantly decrease costs.” Whether at the organizational or individual level, what problems or challenges exist in the system? If “your system is perfectly designed to give you the results you’re getting,” then what problems need to be addressed and are you asking this question regularly? Taking Action toward Transformation: “Put everybody in the company to work to accomplish the transformation. The transformation is everybody’s job.” If, as noted above, we have identified the problems holding us back, then it is time for action based on these identified problems. Deming’s final point is a call to action. If at an organizational level, this means focusing everyone’s attention on the problems that need to be addressed and the transformation that is desired. If at an individual level, this translates into prioritizing desired outcomes and shaping our decisions and actions toward this desired transformation. In addition to Deming’s 14 Key Principles, another helpful lesson from Deming’s thinking is Deming’s Wheel. Deming’s Wheel is a four stage process focused on (1) planning, (2) doing, (3) checking, and (4) acting, and helps to simplify core steps along a path of continuous improvement. 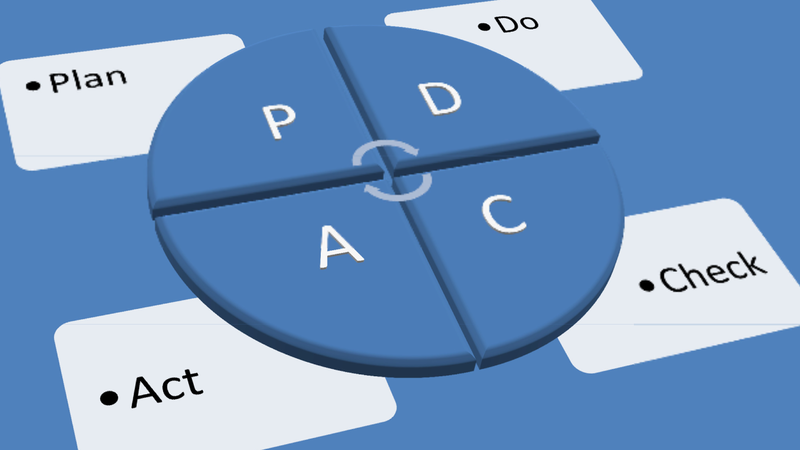 Whether at the organizational or individual level, Deming’s Wheel of Plan – Do – Check – Act provides a memorable model for engaging in continuous improvement. Consider what transformation you desire in your life or in your organization. (1) Make plans for an improvement. (2) Do the planned activity toward this improvement. (3) Check the results of the activity you did. (4) Act/Revise your future planning based on the observed results. “Your system is perfectly designed to give you the results you’re getting.” What are your results telling you? Perhaps Deming’s approach to continuous improvement will provide you with some practical insights on how to take the next step toward improvement both organizationally and individually. It’s time to Plan – Do – Check – Act.